SK hynix recorded another record-breaking operating profit in the third quarter of this year, but the chipmaker might scale back its investments next year, the company’s chief financial officer said during a conference call Thursday. The company had expanded investments for this year by 30 percent from last year’s 10.3 trillion won ($9.05 billion) on robust earnings continuing for the past two years. “This year we made aggressive decisions on investments in order to ease short supply, but we are planning to set a flexible plan that will respond to some uncertainties,” Lee said. 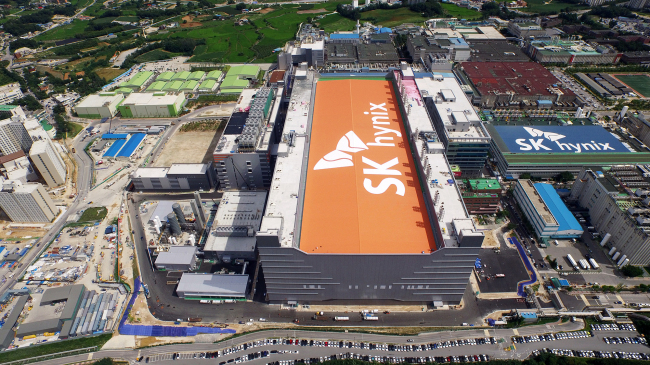 According to the memory provider’s earnings announcement, SK hynix achieved 6.47 trillion won in operating profits for the July to September period, up 16 percent from the previous quarter. Consolidated revenue stood at 11.42 trillion won, up 10 percent during the same period. One of the uncertainties the company is taking into account is possible slowdowns in the growth of DRAM prices, the main profit source of SK Hynix, accounting for about 80 percent of its total sales. The chipmaker will start operations of its newest M15 fabrication line in Cheongju, South Chungcheong Province, next year with a plan to mass produce 72-layer NAND flash chips in late March. Its new DRAM line in Wuxi, China will open in December and start mass production in the second quarter of next year, the CFO said.